Indoor Cycling is my favourite way of performing cardio workouts in the winter. 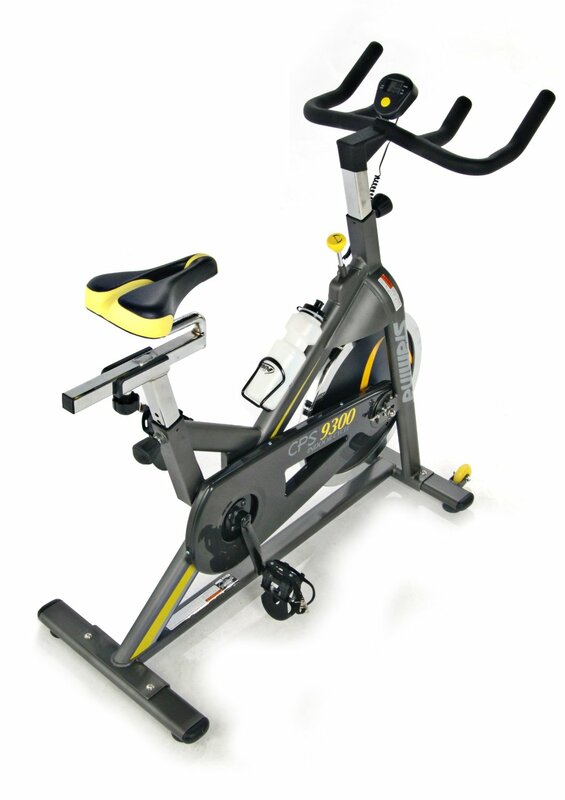 Having tried running machines, ellipticals, recumbent bikes, nothing gets the heart beating like a fixed wheel indoor cycle like the Stamina CPS 9300 we are reviewing today. These are real back to basics exercise bikes, they want you to focus on one thing riding hard! All indoor bikes are built around one key area. The fly wheel. Its very simple heavy is better, and they don’t come much heavier than the 40lb fly wheel attached to the 9300. 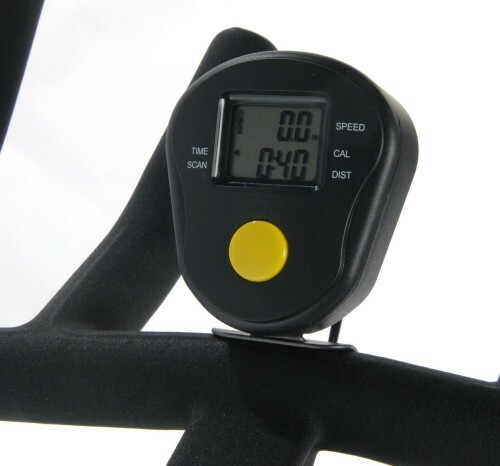 This will ensure that when at speed you get a nice constant pedal motion that smooth without a ‘kick’ coming at the top and bottom of the pedal motions as the pressure changes on the pedals. linking that massive flywheel to the pedals is of course the chain. This is not like the chains that you find on your outdoor bikes, Stamina here use an advanced polymer chain. Its more like a belt drive, the advantage of this is that its exceptionally quiet, easy to maintain and smooth to run. Having owned a chain drive indoor cycle I promised myself never again! Connecting the rider to the bike is the saddle. This is a love hate thing. As it happens the stock saddle is actually fairly comfortable. If you happen not to like it then a gel saddle is an option. Personally I prefer not to use gel saddles, as they are a little to thick and i find that they rub to much. When riding one of these I always wear a pair of chamois lined cycling shorts. They give me the comfort as well as the cooling needed to pedal for an hour or so. The saddle and handlebars are fully adjustable to provide a great comfortable position. The final element of the drive train. The pedals on the CPS 9300 are OK, they consist of a large flat side for those that don’t like the clips. The other side has a toe clip/cage that will allow more effort to be transmitted to the pedals on the upstroke. Again this is personal choice but I wear SPD’s when riding these. They are not an option here so if that is your preference I would add a set of SPD pedals in at the check out. Or take them from another bike! The attachment is universal. At this price you won’t get magnetic resistance (the Keiser M3 is about $1500! ), on the 9300 it is delivered using a felt pad pushed against the fly wheel. Resistance is increased by turning a convenient knob on the frame. This gives resistance from none to really cannot turn the pedals any more – or legs of steel mode! OK its basic, but what else do you need? It shows tracks time, distance, speed, and calories burned. Personally I would always wear a heart rate monitor to keep my self in the golden training zone. A cinch. Most of the bike is pre assembled, pop on the saddle and the pedals get changed and you are good to go! 20 minutes from opening the box. What are others Saying about the Stamina CPS 9300? This is actually a very popular bike with quite a few fans, overall its rated 4 stars out of 5 on Amazon. Not bad for a bike like this. Most of the praise is due to the heavy fly wheel giving a very comfortable ride. The saddle is also comfortable. The only reason for not achieving a full five stars is that the handlebars can move slightly when under full load. This is common for bikes in this price bracket. For more solidity you need to move up to $800-$900. If you are into your indoor cycling I would recommend that you add these to your birthday list: SPD pedals and shoes, Cycling Shorts, Heart Rate Monitor. And whatever model of indoor cycle you choose get a heavy flywheel, you will thank me later! Overall this is a very high quality bike for not a lot (under $500) of money. The next step up would be the Sole Fitness SB700 where the frame is slightly stronger, and the price is about $700. If $500 is your budget then the Stamina SPS 9300 would make an excellent choice.